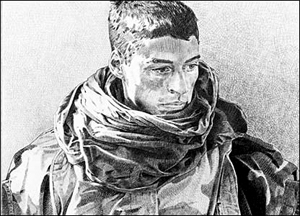 WHAT ART CAN DO: Done in 2002 in Afghanistan, Marine Warrant Officer Michael Fay's pencil drawing of Lance Corporal Nick Ciccone is one of the most compelling works on display in "Fire and Ice: Marine Corps Combat Art from Afghanistan and Iraq," which will be at the the James A. Michener Art Museum through October 21, along with Suzanne Opton's photography exhibit, "Soldier." According to a social worker who counsels soldiers returning from Iraq, “A lot of them have what we call ‘the thousand mile stare’” (quoted in the July 15 N.Y. Times). The phrase provides a suitable caption for the stunned, drained, abstracted expressions on most of the faces in Suzanne Opton’s portraits of soldiers back from deployments in Afghanistan and Iraq (the subject of last week’s art review); the “stare” is perhaps even more evident in the companion exhibit at the Michener, “Fire and Ice: Marine Corps Combat Art From Afghanistan and Iraq,” which features drawings and watercolors done in the combat zone by Marine Warrant Officer Michael Fay. Look at Fay’s drawing of the face of Lance Corporal Nick Ciccone and you know that while the “thousand mile” metaphor makes a handy catch-phrase, it comes nowhere near the interior distance this soldier is contemplating. Fay’s note tells us that Ciccone was sketched in 2002 in Afghanistan after a “12-hour mission that became a nine-day ordeal.” Look more closely and it’s hard to believe he will ever be able to absorb what he’s been through. He’s up against something immovable, unspeakable. You don’t want to know what he’s seeing or thinking. It’s the definitive dead end. The artist himself tries to get at the implications of the image with a caption referring to “the weight of a walk on the rocky and frozen back of Purgatory that still hangs heavily on [his] shoulders.” What makes this portrait one of the most compelling images in the show (it’s featured as such: you can’t miss it) is not only the rendering of the face, but the attention given to the folds and contours of the clothing Ciccone is wrapped in. Fay has sketched that rocky landscape into the fabric. It’s as if the soldier were wearing the “weight of the walk.” In fact, he doesn’t seem to be wearing it so much as being worn by it, its victim, trapped inside it, swallowed up by it. Even if he created this image from a photo all but identical to what we see, Fay has done so with an artist’s sensitivity to the human, aesthetic, and symbolic dimensions of the moment he’s capturing. It’s amusing to imagine former Defense Secretary Donald Rumsfeld’s reaction to the notion of a Marine artist among the troops in Iraq and Afghanistan touting “art for art’s sake” over “Kill! Kill!” After all, it’s those “artist types” in Manhattan who overwhelmingly rejected George W. Bush in 2000 and the man and his war in 2004. To the “moral majority” of the hard-core Right, art is something to be mistrusted, mocked, and despised. Yet here’s a combat artist, a patriot, a marine himself, who is refreshingly upfront about the art invested in his subject and is able to perceive it in the context of war as far back as Greek antiquity and a statue like The Dying Gaul. One way to see behind the “thousand mile stare,” by the way, is to check out films like The Ground Truth. Here are no Michael-Moore-type arm-twistings and intrusive, manipulative arrangements of reality. You meet soldiers, male and female, who have come back from Iraq profoundly shaken by the experience, some possibly beyond saving. In their hair-raisingly articulate descriptions of the psychic costs of Iraq, it’s not only what they say that comes across, but the way they say it and the gestures they use (one of them had no hand to gesture with). Then there’s the drawing of Lance Corporal Adrian Jones, who lost both his legs from the knees down in Iraq. Photos of soldiers with prosthetic limbs are all over the internet in spite of the adminstration’s effort to suppress them. But this sensitive portrait is something else again. When Fay chose to sketch Lance Corporal Jones, he had to confront and transcend the dehumanizing architecture of the artificial limbs. The effect could have been merely grotesque. Fay proudly declares his refusal to shy away from such images: “If something I do is controversial, then the reality is controversial.” What comes through, however, would be “controversial” only in the eyes of those determined to deny or disguise the truth of this war. What matters here (and the same dynamic can be seen in The Ground Truth) is the contrast between the ugly mechanism of disability and the stern dignity and force and depth of expression in the soldier’s face, all within a composition that does full justice to details like Jones’s rumpled trousers and the way the steel chair-legs reflect the steel of the artificial limbs. This soldier does not look disabled. He looks enabled, solemn, determined. No thousand-mile-stare is in evidence.